On Thursday May 11, around 150 Konica Minolta production print users gathered in Vienna for a day of presentations at the inaugural meeting of PROKOM, the Konica Minolta user community. Targeted at production users, PROKOM is part of a Konica Minolta customer-centric strategy intended to drive the move from analog to digital print processes. With the focus, at least at first, on users of cut-sheet light to mid-production color and black & white digital print, the opportunity for PROKOM is unlike many other user groups, which tend to focus on higher levels of production. The journey toward PROKOM began over a decade ago when Konica Minolta began actively targeting users in production environments. A key date for this was drupa in 2004, the first production event at which a combined Konica Minolta exhibited. Today, Konica Minolta has a sizable presence in production and expects to continue that move with product rollouts like its KM-1 B2-format production digital printer. This Konica Minolta movement to production is illustrated by a statement made by a Konica Minolta U.S. executive at the event who reported that production & industrial print accounts for 25% of its North American placements. With a strategy that includes such a production focus, it is not a surprise that Konica Minolta would want to help build a user community to educate and support this segment. Andrew Davis, author and keynote speaker who also moderated the event. Johannes Bischof, Konica Minolta Cluster Managing Director, who welcomed the audience and provided background on the history of Vienna. Toshitaka (Toshi) Uemura, General Manager, Konica Minolta Inc., highlighted some of the innovative print collateral that was produced for PROKOM including a boxed welcome package and a diecut card with printed circuit and battery that allowed it to light up. Andy Barber, Managing Director (Digital) UK Mail Ltd., who is the Chairman of PROKOM. Steve Lister, Innovation and Sustainability Director, Konica Minolta, who spoke about Charterhouse (Konica Minolta’s Marketing Services division); he stressed that print and marketing could be made more useful by making it more experiential. Christian Kopocz, founder of Prindoz, who is also a PROKOM board member. Peter Muir, President of Bizucate, who spoke about the danger and rewards of learning a new skill that could kill you. Neil Falconer (PrintFuture) & Dawn Nye (Konica Minolta U.S.) who spoke about a new PROKOM e-learning platform with “How to” courses in five languages: English, French, Spanish, German, and Italian. Ashley McConnell, International Business Development Manager at Konica Minolta Business Solutions Europe, who spoke about immersive experiences. Karl-Friedrich Edenhuizen, Product Manager Production Printing for Konica Minolta Business Solutions Europe, who provided a sneak peek at an upcoming Konica Minolta announcement. 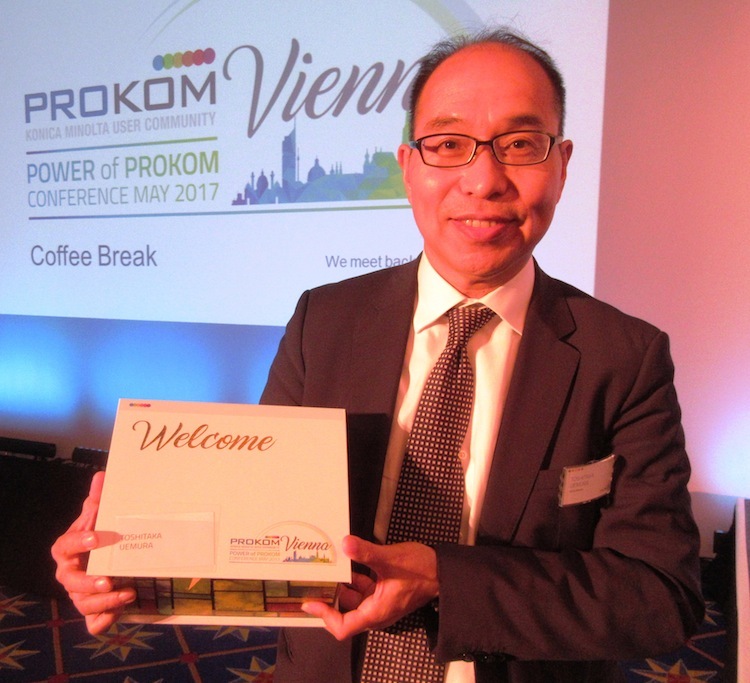 Toshi Uemura of Konica Minolta with the box for the PROKOM welcome package. In addition to the PROKOM board chair, Andy Barber of UK Mail, the other board members representing the user community are: J. Chris Bowen of Cohber Press (West Henrietta, NY, USA), Christian Kopocz of Prindoz (Lübeck, Germany), Andy Fry of Nova Direct (West Sussex, UK), and Jacky Gerard of Quick Print (France). Toshi Uemura will represent Konica Minolta on the PROKOM board. Neil Falconer and Richard Gray of PrintFuture are also involved in promoting the PROKOM initiative. KM-1 users: Four early KM-1 user sites were represented at this event: Cohber Press, PostcardMania, Rehms Druck, and PLS (Print Logistic Services). 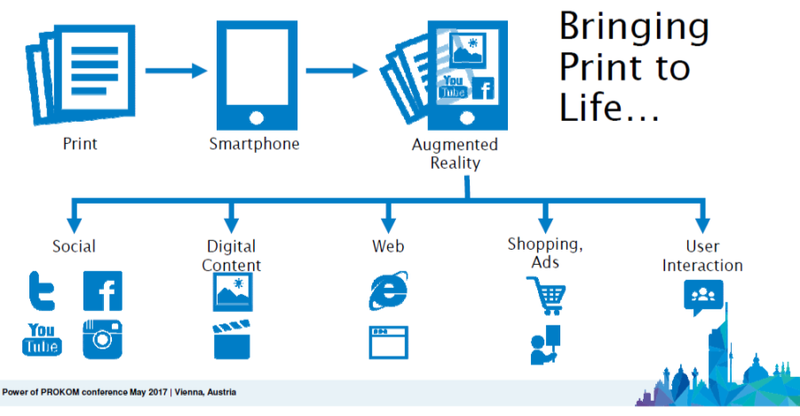 Augmented Reality (AR): Konica Minolta highlighted an augmented reality application that it hopes its users will leverage to connect to print. Accurio branding: An important aspect of understanding Konica Minolta’s Accurio branding (which the company describes as advanced, automated, accurate) is to see how the product branding breaks out between software solutions, inkjet systems, and two levels of toner-based systems. The AccurioPress C6100/C6085: PROKOM attendees got a sneak peek at a new product called the Konica Minolta AccurioPress C6100, which was displayed at the event. Planned for availability this summer, the 100-ppm C6100 (and its sister product, the 85-ppm C6085) are successors to the C1100 and C1085. New features include long-sheet banner printing (with a dedicated feeding option), envelope printing, and support for substrates up to 400 gsm. A new integrated color care unit that includes a scanner and spectrophotometer is designed to improve color consistency and accuracy. The organizers report that PROKOM has drawn about 700 members so far from 20 countries around the world. Begun as a European initiative, four of the five Konica Minolta users on the PROKOM board are from European countries. The next meeting will take place in Budapest, Hungary in June of 2018. Expansion into the United States is expected soon. A lunch & learn is planned at Print in September. A U.S. PROKOM event will follow sometime in 2018. There are currently no plans for expanding PROKOM to Asia Pacific or other regions, though that could happen over time. To become a PROKOM member you must own a Konica Minolta product (and have the serial number) to be eligible for the free and elite membership levels. The elite membership, which provides greater access to web-based materials like the new e-learning courses, requires an annual fee (approximately $500). For more information see www.prokom.org.